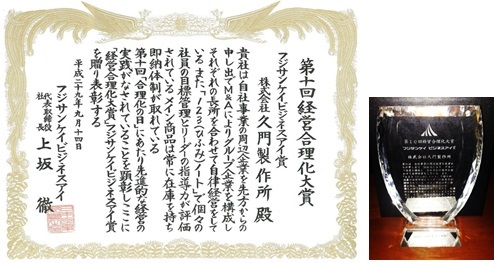 We are glad to inform you here that our company: Hisakdo Co., Ltd. has been awarded for “Fuji Sankei Business Eye Prize” in The 10th Rationalization of Management Award, announced on September 14th in 2017. This prize, established by Association for Rational Administration (Osaka) Inc. in 2007, is awarded for unique and outstanding companies for their progressive and innovative ways of business development, establishment of advanced business models, or the creation of new company value. As a trading company, we believe that our greatest assets are “credit” and “our employees”. Based on this notion, we implement solid management practices focusing on human resource development. Meanwhile, we have also expanded our business in both domestic and international markets through strategic alliance between several partners including M&A. These points have been highly evaluated in the mentioned award. Copyright © Hisakado Co.,Ltd. All Rights Reserved.